M.S. Subbulakshmi’s voice is the kind which comes once in a century. In their endeavour to describe it, critics have run out of adjectives and devised metaphors. They’ve compared it to a rope of gold, a chain of coruscating crystals and a string of spring jasmines. Chennai surgeon Dr P.V. Cherian is said to have refused to operate on her for tonsillitis for fear of damaging one of nature’s marvels. Such hyperbole is hard to resist when writing about one who has won the highest honours in music and been awarded the Bharat Ratna. Yet, she does not strike the postures of a celebrity. Her art and artlessness have the same origin, the spiritual dimension of her personality. This element, recognised and nurtured by Rajaji, Mahatma Gandhi, the Kanchi Shankaracharya and Sathya Sai Baba, casts an instant and lasting spell even on people unlearned in the intricacies of classical music. Hence the extraordinary popularity of her bhajans. No singer outside the film world has probably surpassed her in the music market. Her songs resound in temples from early morning till late at night. But M.S. no longer sings. It should be no surprise if a musician nearing her 90s has stopped performing and recording. But the reason why she has fallen silent is the death of her husband Sadasivam. They were an unusual couple. When they married in 1938, M.S. was already a highly successful musician acclaimed for her beauty and her music. 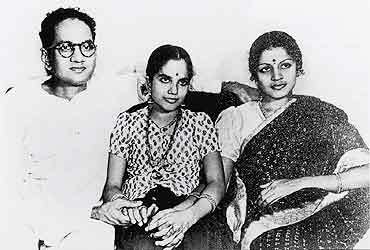 Sadasivam was a little-known nationalist worker who was 14 years older, and had two daughters from an earlier marriage. There were people who envied him his undeserved luck and spread tales about the beauty and the beast. But the marriage turned out to be one of the great love stories of our land. Sadasivam guarded her as a cobra is said to guard the jewel. He helped her deepen her musical knowledge and also brought her in touch with scholars, poets and philosophers. His organisational abilities also came into their own. He worked for the publisher/film producer S.S. Vasan and later started his own magazine Kalki. He raised the capital for it by producing a musical film with M.S. He produced another film with her as Meera. Meera enabled M.S.’s fame to leap across the Vindhyas. The songs she sang in it were soon on everyone’s lips and even appealed to Gandhi. The film was praised by Sarojini Naidu, Jawaharlal Nehru called her the queen of song. From then on, her concerts were almost entirely in aid of charity. How many millions she gave away there is no knowing, for there was a reckless showiness in Sadasivam’s philanthropic urge. They lived and entertained in great style for some years. Then Kalki had to be closed and they went through hard times, but the money from M.S.’s recitals was not spent on themselves. Sadasivam not only managed M.S.’s professional commitments, he exercised absolute, even tyrannical, control over what she should sing. The surprise is that she did not resent it. The way she looked at him and sought his approval made it appear as though she sang only for him. Fortunately he had enough knowledge of music. When friends ribbed the formidable man, she enjoyed his discomfiture like any young bride. "He should have been around. Such things meant far more to him," she said when she received the Bharat Ratna in 1998. For Kunjamma, the daughter of a professional musician of Madurai, it was a long journey. If M.S. is not given to talking about herself and illuminating the less known aspects of the story, it is not discretion but her self-effacing nature. It needs a skilful biographer to tell her story. But Lakshmi Vishwanathan’s book is most welcome. Her mother was M.S.’s lifelong friend and she is an artiste in her own right. A special attraction is the collection of photographs from M.S.’s personal collections. There are valuable pictures showing her with some of her great contemporaries. But more fascinating are her radiant portraits at every stage of life. And what eyes. They’re a painter’s ransom. One would have expected a more sophisticated foreword from Semmangudi Srinivasa Iyer. The author gives some glimpses of the human side of M.S. : her fondness for diamonds and for silk saris of a particular shade of blue later known as M.S. Blue. These were specially woven for her by a Madras silk merchant. It tells us that fear of a sore throat had stopped M.S. from ever tasting ice cream. But one wishes there were more such sidelights. Like the ‘chukku coffee’ which M.S. offers to visitors. It is not coffee but a concoction of ginger and milk. Having tasted it, I can guarantee that it is good for the throat. It is time for a major study of M.S. Subbulakshmi’s music.